Gov. Martin J. O’Malley’s effort to repeal Maryland’s death penalty appears to be gaining momentum. Gov. O’Malley said on Feb. 25 that he is confident a Senate committee that has defeated repeal legislation each of the past two years would send it to the full Senate. The governor said he has no doubt the bill would win the 24 votes needed for Senate passage and, if necessary, 29 to break a possible filibuster. Even if the Senate Judicial Proceedings Committee defeats the repeal bill, Senate leaders have said, they’re considering a procedural move to advance the measure to the full Senate. Senate President Thomas V. Mike Miller hopes for a committee vote, possibly this week, but, even if it defeats the bill, a procedural move could send the measure to the full Senate, said Patrick Murray, Sen. Miller’s deputy chief of staff. The governor said he has talked to senators over the past week or so and that some who had been undecided now favor repeal. Standing alongside the governor in front of the State House, Bishop Madden called on clergy members to goad their flocks to contact lawmakers and urge repeal. 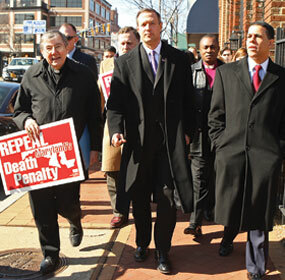 Mary Ellen Russell, executive director of the Maryland Catholic Conference, attended the prayer breakfast, march and a news conference on the death penalty. “I think it’s poised to pass this year,” Ms. Russell said. But, she added, Catholics should not grow complacent. “I can’t say enough how imperative it is for people to make their voices heard” and tell legislators to abolish the death penalty, Ms. Russell said. The bill is believed to have enough support to pass the House of Delegates.